After dealing with questions about whether or not he was a system quarterback this week, Goff delivered one of the best performances of his career in the win over the Chargers. He was sharp throwing the ball downfield, completing 9-of-11 pass attempts 10-plus yards downfield, including going 2-for-2 for 75 yards and a touchdown on throws 20-plus yards downfield. This is the player that the Giants were hoping to get when they drafted Barkley with the second overall selection in the draft back in April. Dynamic as a runner and a receiver, he forced five missed tackles from 22 touches and found multiple big plays. The Giants even lined him up out wide, with the former Penn State star picking up a 21-yard gain on a ‘go’ route late in the game. Williams made a huge play on a 42-yard touchdown reception for the Chargers, showing the playmaking skills that saw the Chargers draft him in the first round a year ago. With 81 yards from 26 snaps in route, he ranked sixth among wide receivers with an average of 3.12 yards per route run. This was a breakout game for the Falcons first-round draft pick, with the former Alabama standout delivering multiple big plays. On the field for 29 snaps as a receiver, he averaged 5.03 yards per route run, the third-highest mark in the league this week. Kittle is emerging as one of the top tight ends in the game and he proved that once again on Sunday. On the field for 22 snaps in the passing game, he averaged 3.59 yards per route run, ranking second among tight ends this week. From his five receptions, he forced five missed tackles, showcasing his playmaking ability with the ball in his hands. It wasn’t just Barkley who impressed on the Giants offense on Sunday as their star wide receiver came up big too. If the Giants game plan was to get the ball in Beckham’s hands and let him do the rest, it worked. From nine receptions, he forced four missed tackles, taking him to a position-leading eight on the year so far. Stanley wasn’t perfect in pass protection, surrendering a sack and a hurry, but he did his best work in the running game. His highlight was a block to the ground of Broncos’ first-round draft pick Bradley Chubb early in the first quarter. After struggling in the opening two weeks of the season, Ragnow put forth the type of performance we saw from him at Arkansas on Sunday Night Football this week. He didn’t allow a single sack, hit or hurry, giving him a 100.0 pass-blocking efficiency rating, and was impressive in the run game too. Lost in the Patriots struggles on Sunday Night was another outstanding performance by their center. He didn’t allow any pressure from 28 pass-blocking snaps, giving him a 100.0 pass blocking efficiency rating, while he also consistently impressed in the running game. McGovern had one of the blocks of the day yesterday, meeting Ravens safety Anthony Levine at the second level and driving him off the screen. In pass protection, he allowed a single hit on 37 pass-blocking snaps, giving him a pass-blocking efficiency rating of 98.0 on the day. Moton has been fantastic at right tackle for the Panthers for the past two weeks and allowed just one hurry from 27 pass-blocking snaps, good for a pass-blocking efficiency rating of 97.2 on the day. He was even better as a run blocker, delivering some key blocks for the Panthers offense. If Vikings fans were concerned about their offensive line heading into Week 3, Hughes confirmed those fears with a dominant performance off the edge. He racked up a sack, two hits and 10 hurries from 40 pass-rushing snaps on Sunday. Hicks was a monster up front for the Bears in their come-from-behind win over the Cardinals, racking up a sack, a hit and four hurries as an interior pass-rusher. He also impressed against the run, proving tough for the Cardinals to find success against no matter the situation. 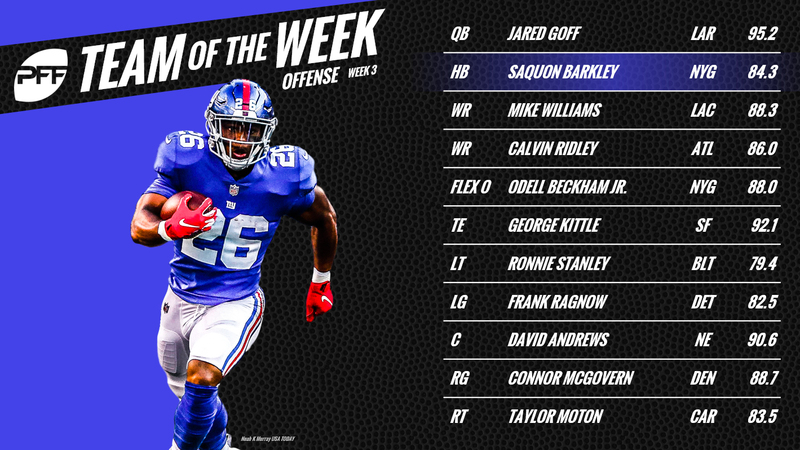 Cox makes the Team of the Week again after another dominant performance up front for the defending Super Bowl Champions. From 41 pass-rushing snaps, he registered a sack and two hurries, and was a force against the run, with two tackles resulting in a defensive stop in that regard. It took Watt a little bit to get going, but once he did, he caused the Giants offensive line lots of problems. He finished the day with three sacks, two hits and two hurries, with the highlight of the day coming when he beat right tackle Chad Wheeler and swatted the ball out of Eli Manning’s hand in about two seconds flat. Regardless of whether it’s in coverage or against the run, Wagner continues to be one of the top linebackers in the game. In coverage, he allowed three receptions from seven targets, but came away with two pass breakups of his own, while five of his six solo tackles on the day resulted in a defensive stop. Jewell had an impressive day for the Broncos, proving himself to be more than solid against the run. It was in coverage where he really stood out though, with his impressive day highlighted by a pass breakup while covering tight end Mark Andrews out of the backfield. 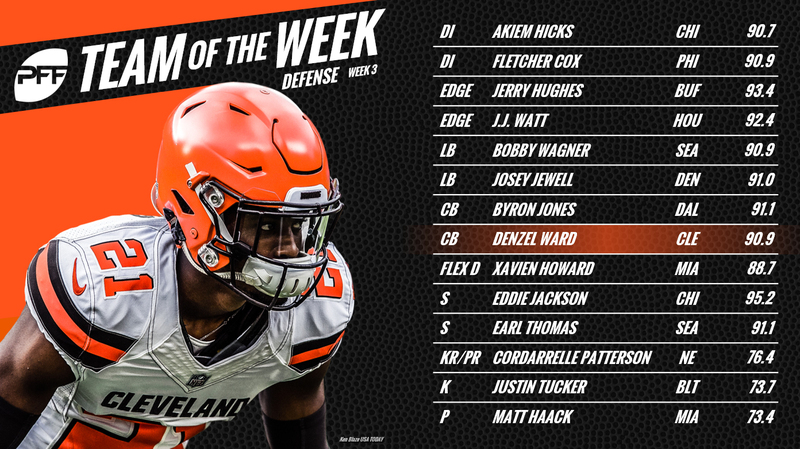 Jones finds himself on the PFF Team of the Week on a Monday once again this week, after another big performance in the Cowboys secondary. Targeted seven times in coverage, he allowed just 10 yards on three receptions and came away with two pass breakups. As the Cleveland Browns picked up their first win in well over 600 days, the fourth overall selection in the 2018 NFL Draft came up big for them again. Ward allowed just two receptions for nine yards in coverage, and also came away with a forced fumble. Jackson is becoming something of a dynamic playmaker in the Bears secondary, and that was the case again this week, coming away with an interception of Sam Bradford early in the third quarter, and a would-be pick-six that was wiped out by penalty in the dying seconds of the game. If things had gone differently according to reports this offseason, Thomas could have been playing for the Cowboys this week. Instead, he was pulling in ridiculous interceptions off of his shoelaces, and sealing the game with another pick off of a deflection for the Seahawks. Howard gave up a long reception to Jordy Nelson, but outside of that, had a really strong day. When covering Amari Cooper, he allowed just one reception for eight yards, and on two targets against Martavis Bryant, came away with a pass breakup and interception. Tucker had one field goal blocked, but on kicks, he could do anything about, he went 2-for-2 from 50-plus yards. The best leg in the game was at it again on Sunday. Haack was good for the Dolphins last week, but even better in their win over the Raiders. Averaging 42.2 net yards per punt, with a long of 63, Haack set his coverage unit up well, and they delivered in allowing just 11 return yards all day. Sunday was an incredibly quiet day for kick returners around the league, with Patterson delivering the top play on a 45-yard kick return in the loss to the Detroit Lions. Simmons had one of the most athletic plays of the week, leaping over the Ravens field goal unit to block the kick. It was returned for a touchdown but called back by penalty.